6th Graders Keep Kindergartners Safe! When you’re a Kindergartner, it can be intimidating to navigate the big, busy halls at school! But fear not, young ones! The 6th grade safeties are here! There is a process to becoming a safety and it begins in 5th grade with a presentation by current safeties sharing what they like and don’t like about the position, qualities you need to succeed at being a safety and why they chose to fulfill this role. If a 5th grader is interested they complete an application and 5th grade teachers are given a chance to weigh in as well, with remarks such as “turns homework in on time”, “has integrity”, “is kind of others”, and “respects authority”. Even specials teachers are given the opportunity to voice their opinion on applicants because they get to know students in a unique environment, over multiple years. Once the roster is selected, training begins. 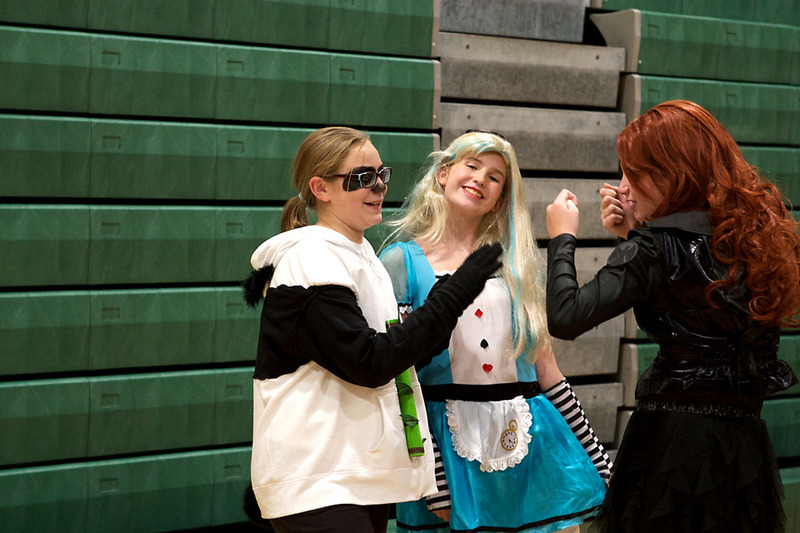 The rain may have been falling outside on Halloween this year but that was no obstacle for Jenison Junior High Student Congress and their Halloween festivities! 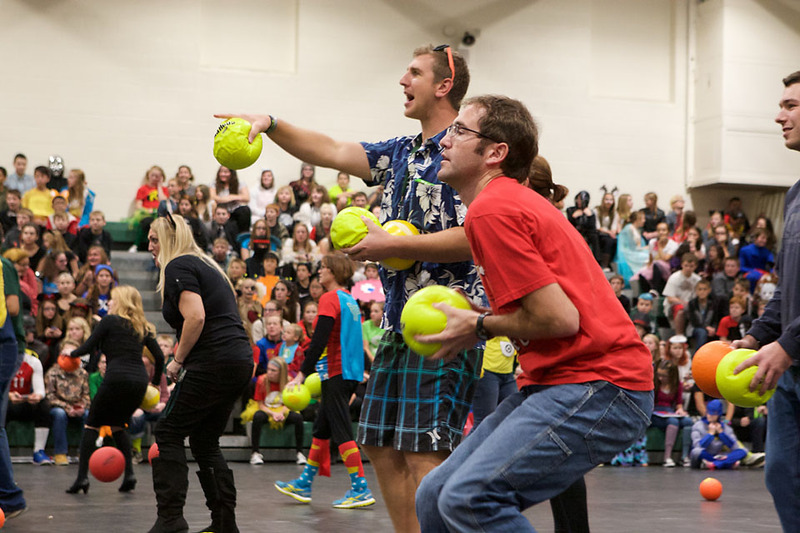 Student Congress faculty advisers Kevin Fales and Mallory DeFouw oversee the leadership of the students as they plan and execute a fun event for the entire school. 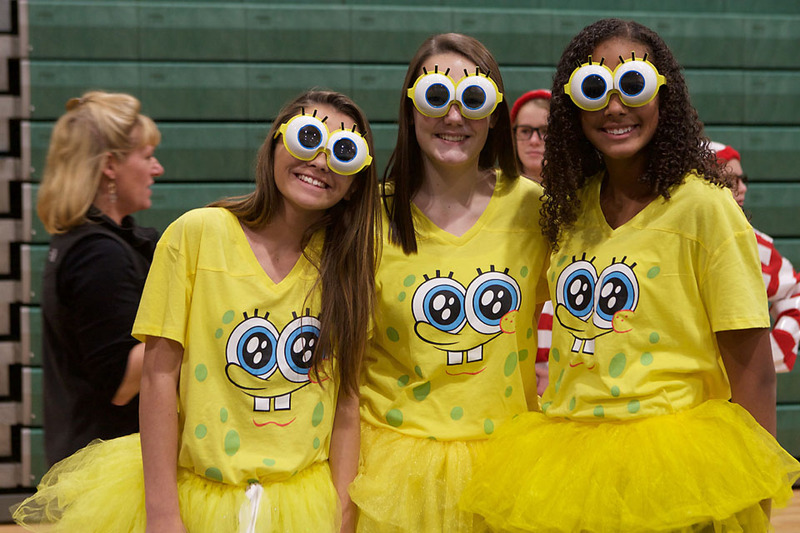 “The kids involved with Student Congress are in charge of planning games that get lots of kids involved. Our members pick up the materials needed for the assembly and during the assembly they are in charge of running each event. They make sure each event goes smoothly and we have some students help explain the events with the microphone while others demonstrate how the game works.” says Mr Fales. 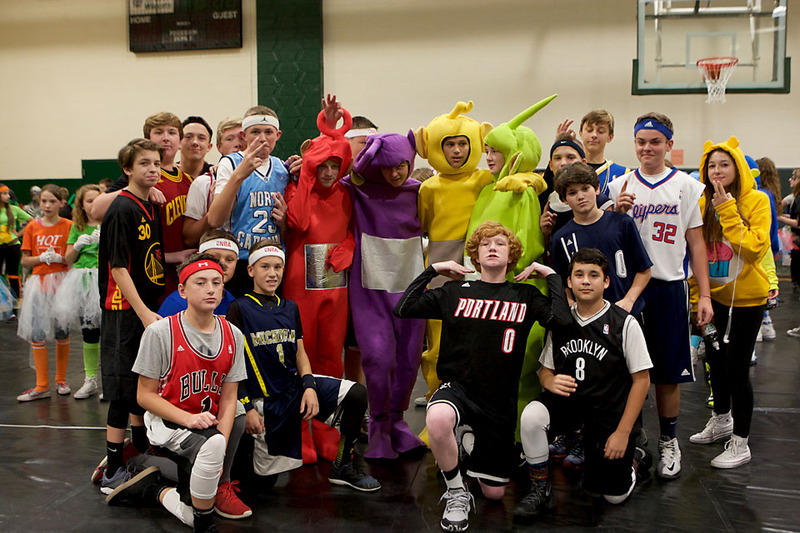 Thanks for another great Halloween, Student Congress! There was more than the wind howling last week Friday! 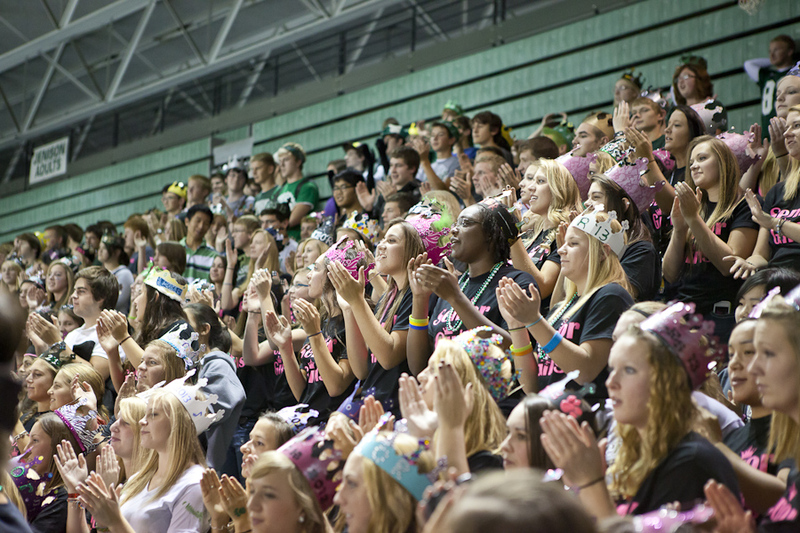 Jenison High School’s gymnasium was alive with raucous laughter and excited cheering as students prepared for the 2012 Homecoming festivities. 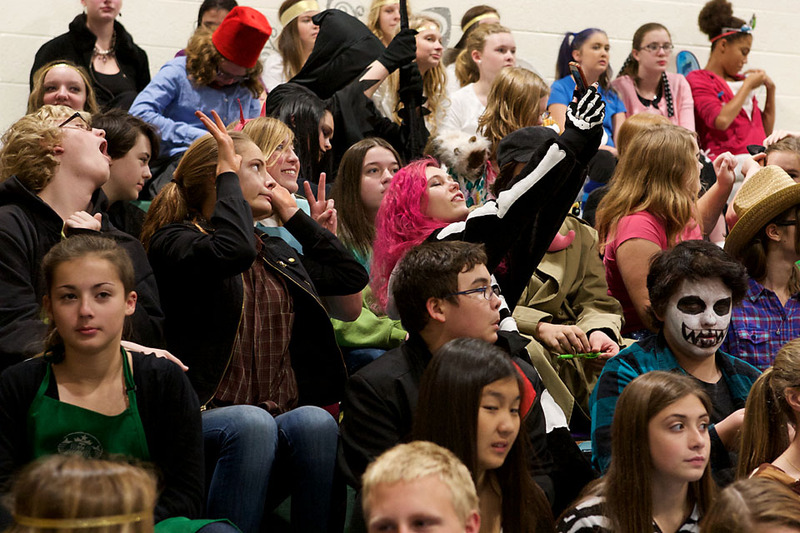 This “Pride Rally”, organized by student congress advisors Julie Roby, Tracy Mossburger and Chuck Russell, along with Principal Brandon Graham, is part of a bigger focus on fostering school pride through participation in school events. Each grade level is awarded “Pride Points” when they dress up for Spirit Week, for example, and those points are recorded and tallied throughout the year. At the end of each school year, the class with the most points is invited to take part in a picnic celebration complete with carnival games. 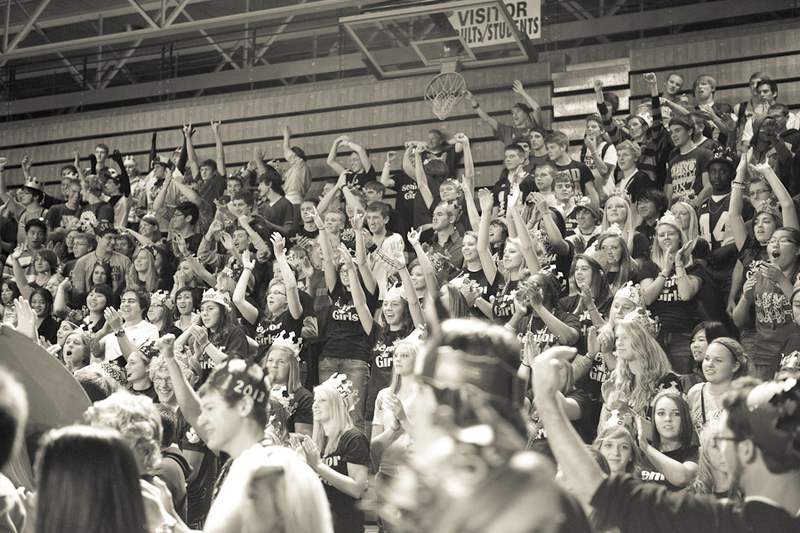 “Creating an environment of pride in our school and in belonging to something bigger than any one individual has been a culture-changing element at Jenison High School. Kids take responsibility for things they’re proud of, and it shows in the hallways, in our classrooms, and on the playing fields, ” Principal Brandon Graham said. 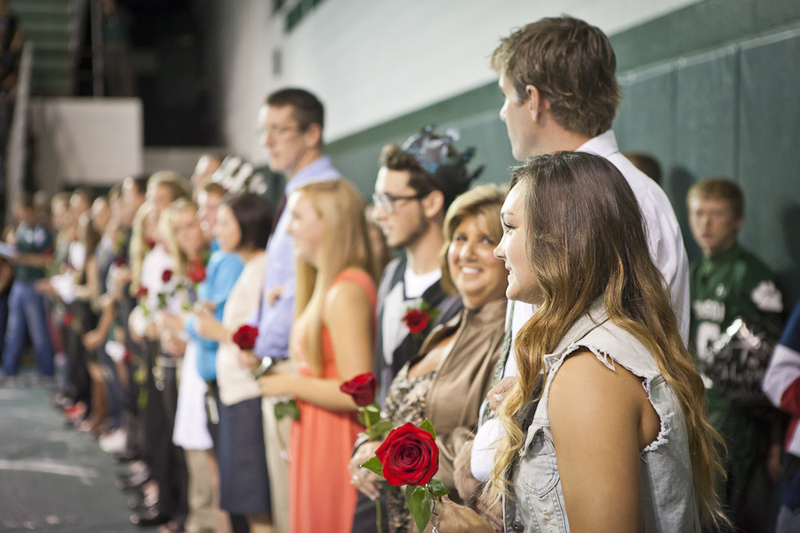 This year’s rally began with a wonderful band performance before Homecoming Court introductions were made. Students were escorted by meaningful teachers in their lives while a short biography was read about each of them. Performances by the high school dance and cheer teams followed. The festivities culminated in the opportunity for students to win pride points for their class in a “Mystery Food” competition. Students chosen to represent each grade were asked to make their way through stations where a brown paper bag awaited them. Inside the bag were several food items for them to blindly draw out. Whatever item was selected had to be eaten, and the class who completed all four stations first, won! 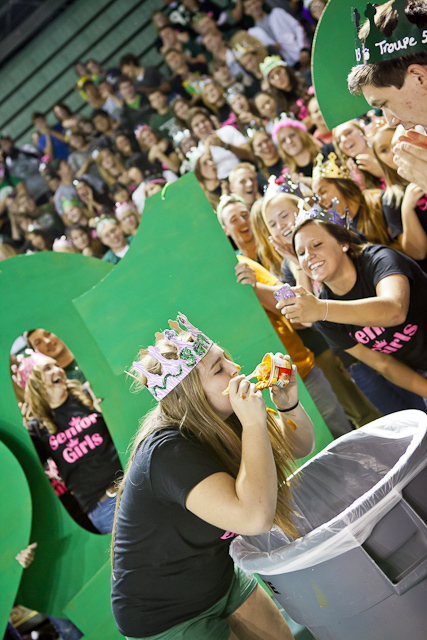 It’s amazing what school pride will compel students to eat! Seen here: hot peppers! Interspersed throughout the afternoon were trivia questions and ovations for new students. 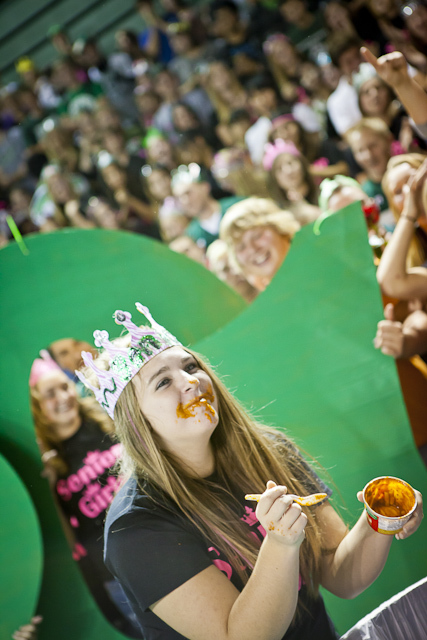 But after the contests ended and the students sat down, the sentiment that remained on display was a fervor for Jenison, for a community of friends, and for the school these students love. On display was pure Wildcat pride. 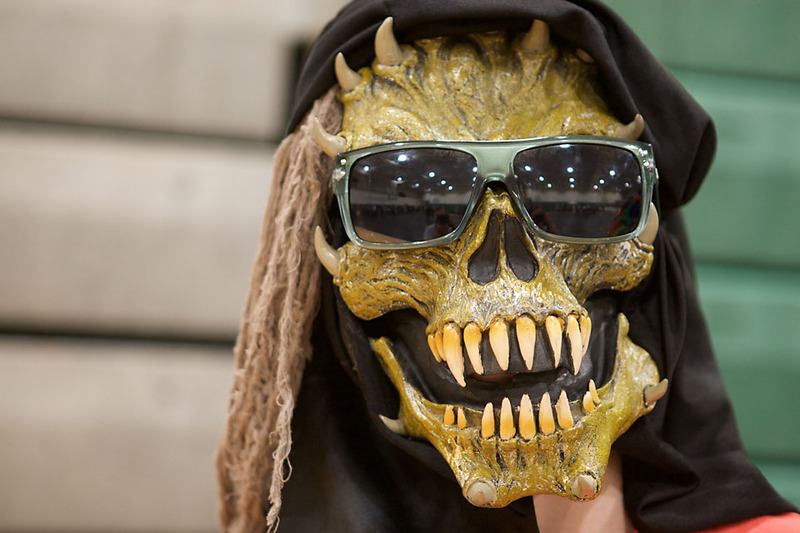 What Homecoming festivities were you able to attend? We’d love to hear your stories in the comments below! 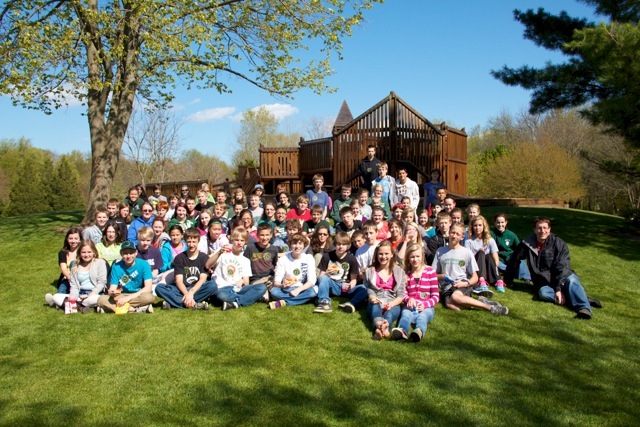 It was a warm spring day when Jenison’s sixth grade ACT students filed into Karen Weaver’s classroom for the final time. The mood was thankful. Innocent. Next year they’ll find themselves moving from room to room in a much larger school, but deep down they’ll always be knit together. They’ll always be family. That’s because this handful of students has been learning and growing together since they began their third grade year. Students involved in the ACT program have shown gifts in the areas of academic studies, leadership, creativity, and motivation. Once admitted, they spend one morning or one afternoon a week with Mrs. Weaver in a small setting which focuses heavily on mathematics, logical thinking, creative problem solving, and project-based learning. 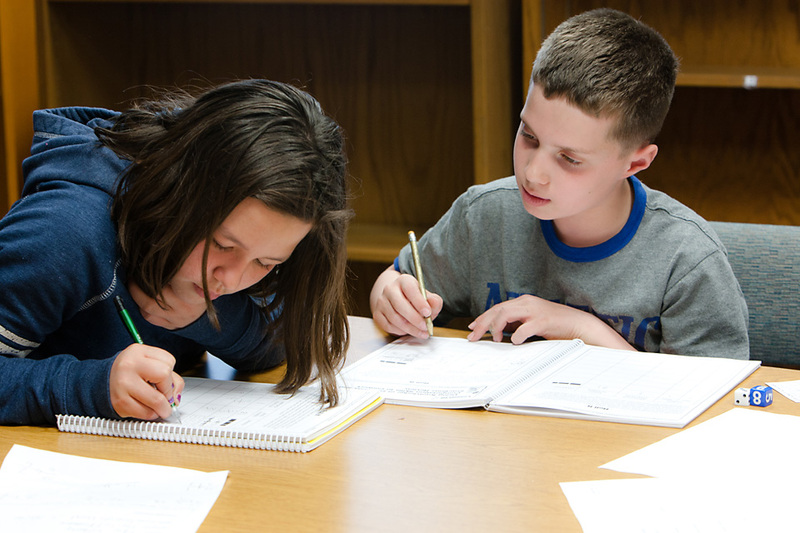 They also compete in the Continental National Math Competition regularly, and this year’s 4th grade was recognized as having the highest score in the midwest! After years of operating like pseudo brothers and sisters, these kids now feel the sting that comes with change. And what they’ll miss most is the teacher who helped the pieces fit together a little bit tighter; who sat close by while they wrestled through a challenge or brainstormed a different solution to an old problem. They’ll miss the teacher who delivered an extra slice of sunshine every week to kids who couldn’t wait to bask in the light. JPS DECA Students Top in the Nation! When Ethan, Nikole, and Taylor first clicked open the Deloitte Virtual Team Challenge this winter, they never thought their work would bring them acclaim as one of the premier teams in the nation! With well over 400 high school teams competing, their third place finish lands them at the top of the class! As part of Dr. Clark’s business class, students teamed up and dove into Deloitte’s challenge to enter an online “virtual” city that was recently affected by an oil spill. As leaders of a fictitious non-profit agency, each team was charged to raise money to clean up their city, research the backgrounds of agencies that could be hired to do the work of controlling the ecological disaster, and investigate and identify a charity insider who was secretly siphoning money from the group. Teams were judged on total overall money “raised” for the charity group. That means that their research into clean-up agencies, for instance, was paramount. Did they secure workers at the best price possible? Did they stop the insider from stealing from the charity?…and after how much money was taken? These things, and more, contributed to the end dollar figure that determined the contest winners. After three weeks of work together, this team of seniors rang in $212,053!! Dr. Brenda Clark explains the intricacies of the DECA challenge. Dr. Clark estimated that teams contributed 10-12 hours of work to complete the challenge, which, incidentally, is the first of its kind ever attempted by Jenison business students. “I loved that this project forced students to consider environmental and ethical factors such as finding the right people to hire and making wise decisions about terminating employment. There are endless ways in which ethics play into business, and the Deloitte challenge encompassed many of them,” Dr. Clark explained. 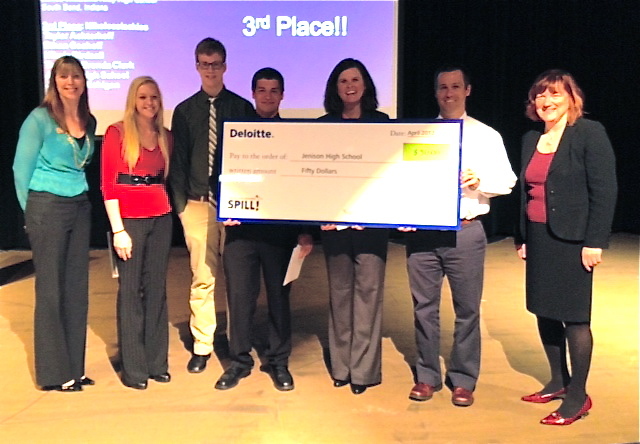 For their third place finish, Deloitte donated $500 to our local United Way chapter, as well as giving each of the three team members $50. Dr. Clark received $50 for classroom supplies and the high school was given $50 for technology, all courtesy of Deloitte! Adding to the excitement in the high school business department is the amazing work of seniors Nikole Birdsall and Levi Adrianson on the National Financial Literacy Challenge. Sponsored by the U.S. Department of Treasury with the hopes of increasing financial literacy in high schoolers nationwide, this test was taken by all JHS business students and 80,000 students nationwide! 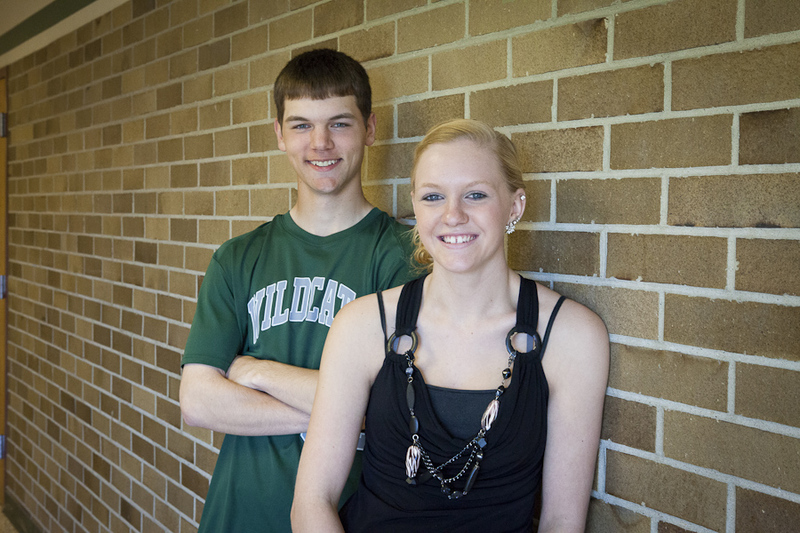 For the first time in JPS history, both Nikole and Levi scored 100% on this test! Furthermore, their scores have placed them in the running for one (each) of twenty-five scholarships given to college-bound students. Our sincere congratulations to the terrific work of Dr. Clark and her business students! We are proud of your exceptional accomplishments! 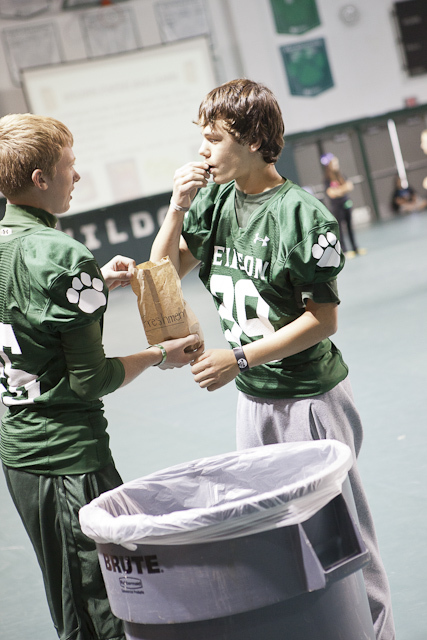 Jenison Junior High Students give back to the community. 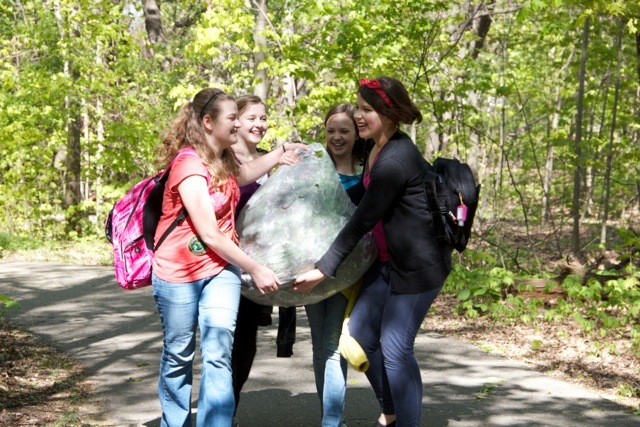 What began at Michigan State University as the research and prevention of another invasive species, has sprawled into an opportunity for students to become environmental stewards and active community members. 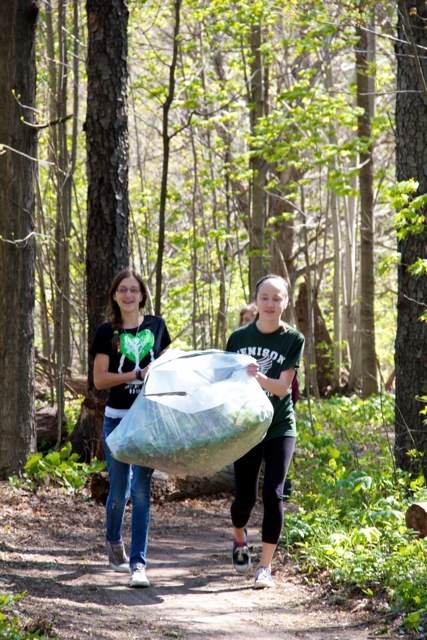 Last week, over seventy-five students and a handful of teachers led by Mrs. Graham made their way to Hager Park and spent the after-school hours scouring the brush and wooded trails for Garlic Mustard: an invasive weed threatening to overtake native Michigan plants and flowers. First brought to “the New World” by Europeans to season their food, Garlic Mustard is edible, but it also monopolizes the resources other plants need to grow and flourish. It additionally releases a toxin into the soil that is harmful to other nearby species. Michigan’s lovely Trillium is one example of a flower suffering at the hands of this unwelcome forest neighbor. 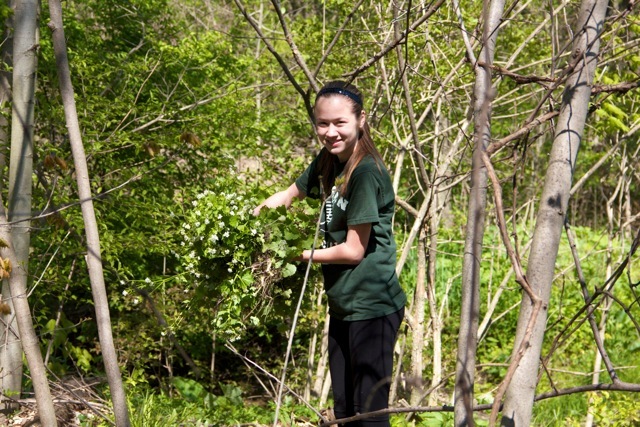 A Jenison student removes an armful of Garlic Mustard. 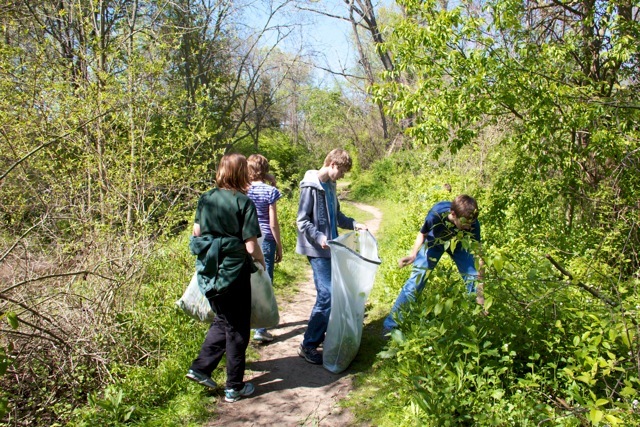 Jenison Schools were first made aware of the opportunity to help control this species when Melanie Manion, an Ottawa County Parks staffer, contacted Mrs. White at our high school and suggested Hager Park as a place to make a difference. The benefits of proximity and community were not lost; Mrs. White’s ecology class conducted field work as part of an invasive species project this past fall. Eager to offer junior high students the opportunity to apply their biology lessons to real-life environmental situations, Mrs. Graham collaborated with Mrs. White to form what is now a 3-year partnership between Ottawa County Parks and JPS. 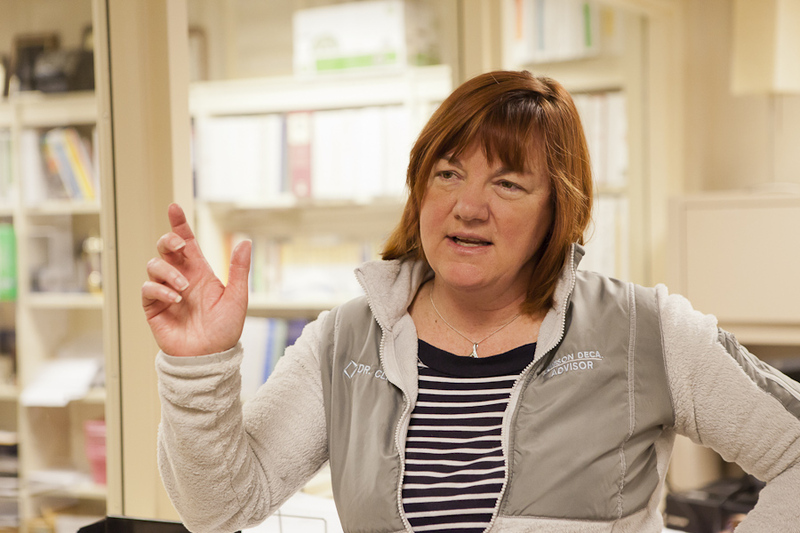 “We’ve committed to limit invasives as much as possible,” Mrs. Graham explained. A difficult task, to be sure, considering that each plant holds an estimated 3,000 seeds! Students are able to walk to Hager after school, bags in tow and hands ready to pull by the root. 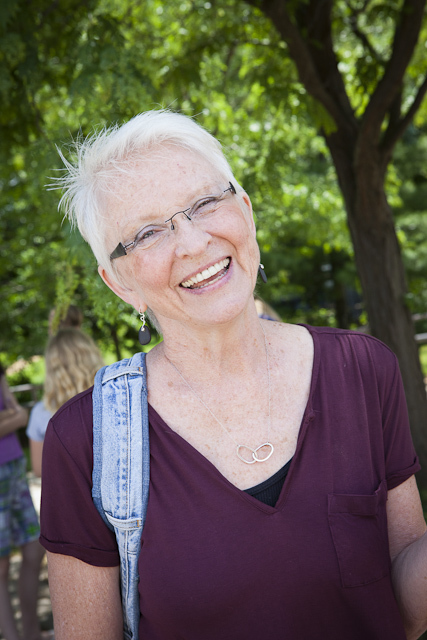 One students shared that she “…used to go to Hager Park a lot and didn’t want to see it overrun.” Others, including Hannah and Carol in the above photo, used the afternoon to take pictures for the Photography Club and hone their skills in a wooded setting with shadows and light. Regardless of why they came, everyone pitched in and the group left with 23 huge bags filled with the plant! That means that Hager Park is inching closer to the natural state we love and want to preserve. It means that our students are applying classwork to the work they do with their hands; it means they’re making our planet their laboratory. And that, friends, is science at its best. Thank you to all the teachers involved in making this partnership a success, and to Mrs. Hunt, of the JJHS Photography Club, for the photos. Additionally, kudos to the group from Pinewood Elementary who successfully pulled one bag of Garlic Mustard from the park! Lexi Kapla & Kimmie Hammink Haul plants from the Hager trail. 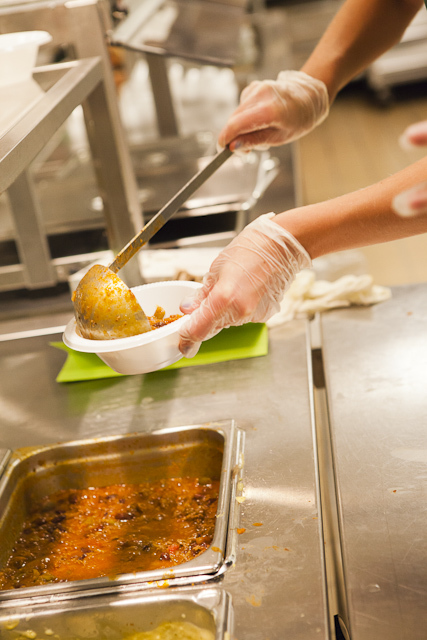 Last week Thursday evening Jenison Junior High did more than serve soup to hungry parents and students; they took a few small steps to help change lives for the folks at God’s Kitchen. Mr. Greenwood, art and ceramics teacher, uses his ceramics class to sculpt bowls during each of his 9-weeks classes. This year he was able to collect 220 bowls that were purchased by JJHS diners, but with the great turnout, the handmade bowls sold out half-way through the event! Gabbi Vachon, Mr. Cataldo, and Ally Douglass (L to R) serve soup together. Students in Mrs. Williams Teen Leadership class graciously acted as “cooks in the kitchen” by serving the food. The Teen Leadership class promotes servant leadership both in and out of class, teaching kids what it means to lead, how to do so, and how servant leadership can help society. 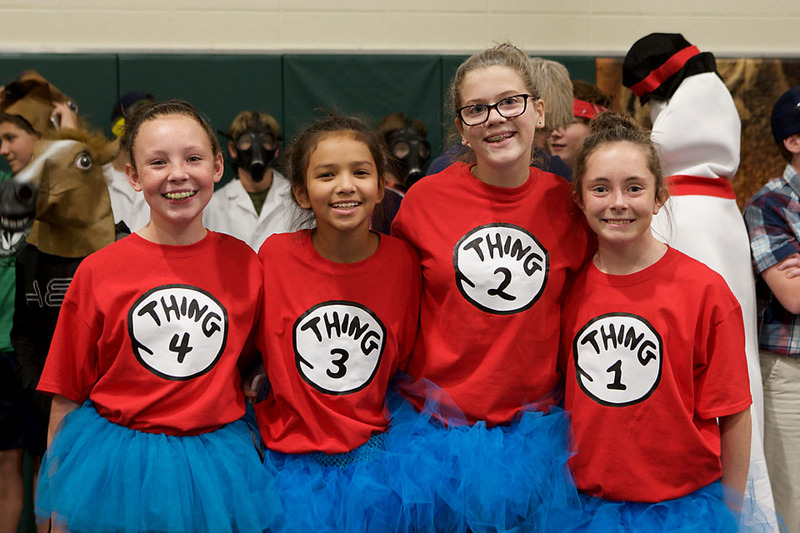 This class is also responsible for the annual “Legacy Project” which aims to leave a mark on the junior high by doing something that will make school easier for the next incoming class. 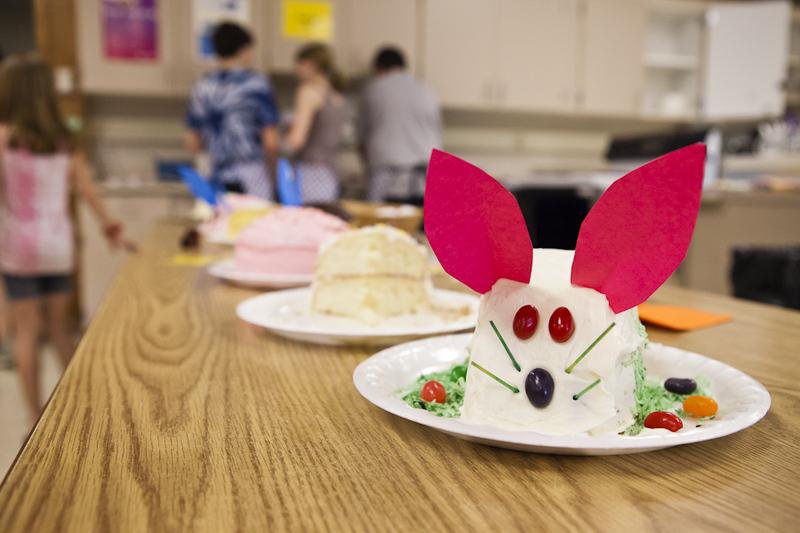 In addition to the supper, students had the opportunity to showcase their best work in every subject area throughout the building. Science Olympiad, the Photography Club, history classes, and several others had displays out for visiting parents and community members to see. Mrs. Mervenne’s Cooking 101 class was eager to show off their culinary creations and share their delicious cookies and cakes. The students in Cooking 101 not only learn how to make spaghetti, all varieties of eggs, breakfast foods, and fajitas, they also spend time discussing the proper way to set a table, take inventory of the kitchen, and properly clean up and sanitize a cooking space. 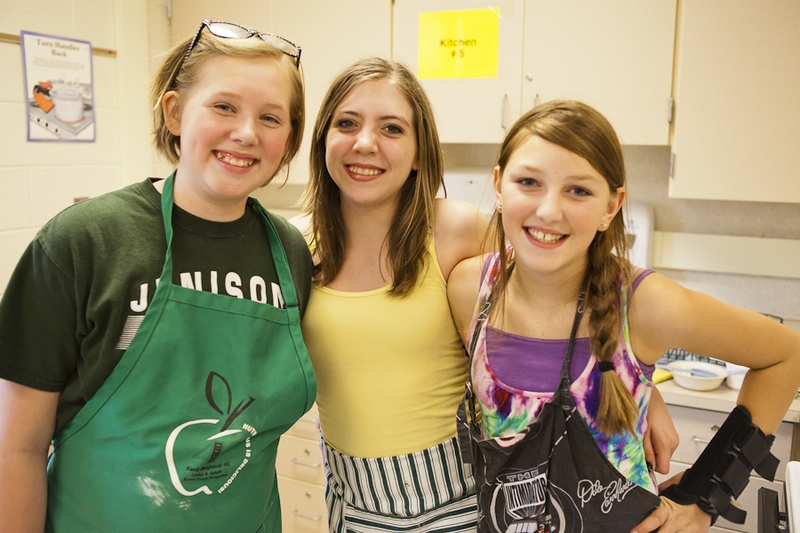 Students Shelby Nyboer, Camryn Bowman, and Allie Stob (pictured above L to R) are on a cooking team together and have loved the experience of working as a group and learning how to make good food together. Their work reminds us all that with a little teamwork and the willingness to create something sweet, great things can emerge! Kudos to the junior high for their efforts to relieve local hunger and make a difference in the world outside their door. We are proud of you! This summer a handful of students and teachers came up with an idea they believed had the power to revolutionize Jenison High School. It wasn’t complicated, it didn’t cost anything, and it didn’t come from a motivational speaker. Instead, it challenged students to be respectful of the school, of one’s self, and to always put their best foot forward. The challenge was to “Stay Classy, Jenison!” Who knew two words would become the language of a high school? The “brand” of its students? 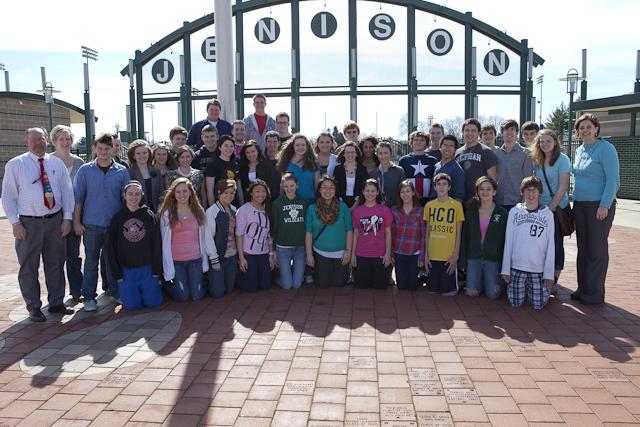 Jenison High School student congress members with 2012 staff advisors. 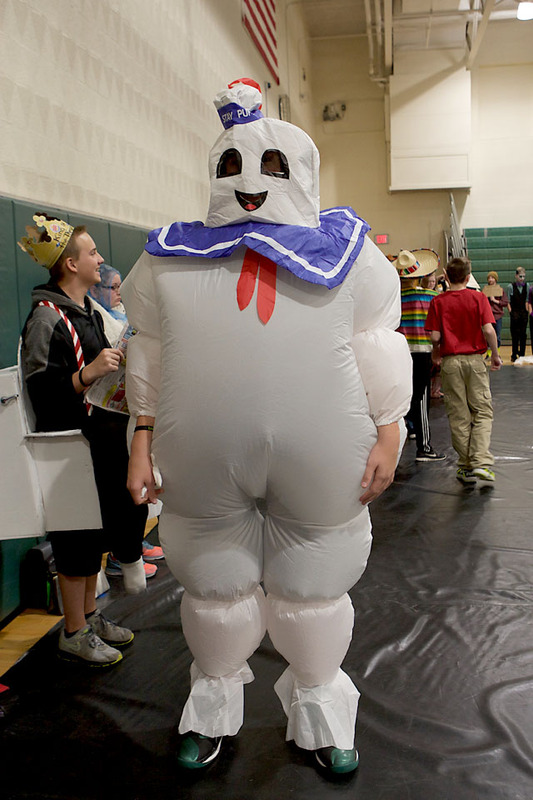 This year’s student congress, comprised of 47 students representing all four grades, have spearheaded several school-wide events such as Homecoming, Powder Puff, Monster Mash Dance, Your Change Can Change Hunger, and NHS Christmas Giving to name a few. Spring will bring Earth Day Activities and Graduation, and student congress will be there from start to finish. The common thread through it all? Elevating the ordinary so that it is extraordinarily classy. It’s the new norm; the new expectation. Connecting students around this “brand” has been made easy with the school’s “Stay Classy” bulletin board. It received a fresh coat of paint this summer and is now the hub for all school student council-led activities. Need a sign-up sheet? Check the Stay Classy Board. Want to see the new T-shirts? Check the board! Advisor Tracy Mossburger recently shared that several students have approached her, thanking her for this central meeting point. 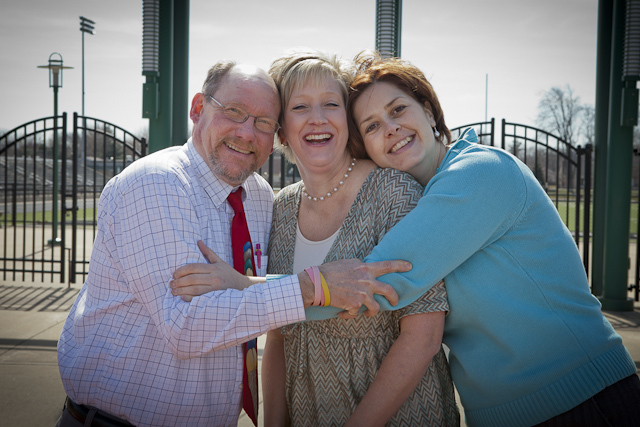 What’s more, the work that Mrs. Mossburger and fellow advisors Mrs. Roby and Mr. Russell do to recognize students makes them the heart of the movement. For example, did you know that at each dance all three advisors spend the evening canvassing the dance floor snapping pictures of as many kids as possible? The goal: make each kid famous by catching them having fun and then posting their photo on the Stay Classy board. After a week or so, students are invited to grab their photos for a fun souvenir. 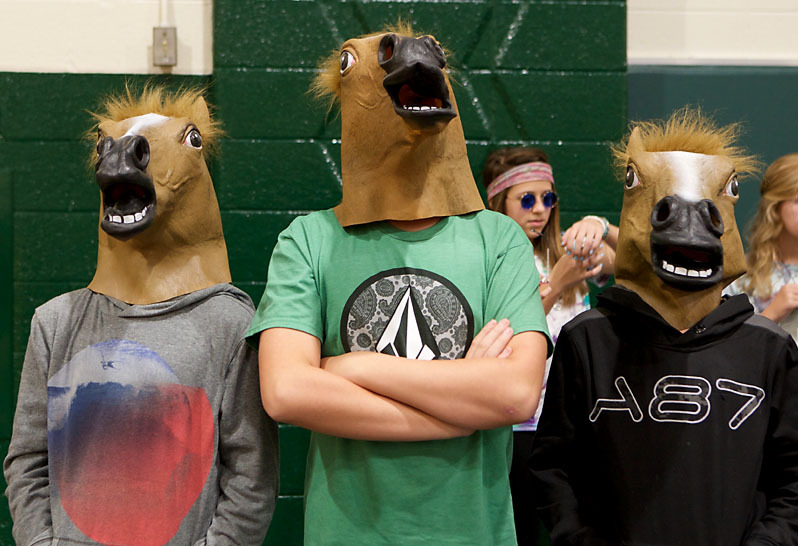 Kids aren’t the only ones talking about this new kind of school pride—parents and community members are noticing, too. 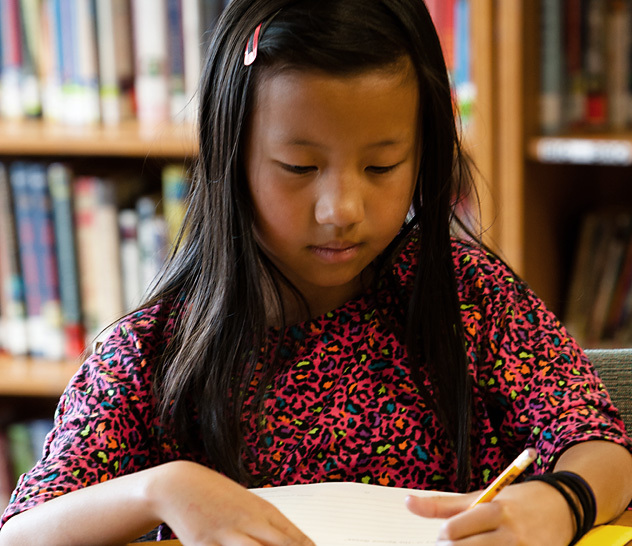 Parents are seeing that small steps toward excellence yield considerable gain. They’re seeing that reshaping attitudes at school, from hallways to homework, means greater care and affection is shown everywhere. We’re so fortunate to not only have a group of students committed to excellence, but a trio of advisors who inspire and motivate kids to strive for their best each day. Thank you, student congress, for keeping us classy!